A gregarious and dynamic comedian with a knack for telling it like it is, Rob has become one of the brightest voices to hit the Canadian comedy scene. With unmistakeable charm, wit and trade-mark act-outs, Rob is a must see performance. Rob has also appeared as a regular on the MTV series Punk'd and recently had his one hour “Comedy Now” special air on the Comedy Channel. In 2013 Rob performed at all 3 Major Canadian TV Comedy Festivals - Just For Laughs Montreal, Ha! Halifax Comedy Fest and The Winnipeg Comedy Festival! 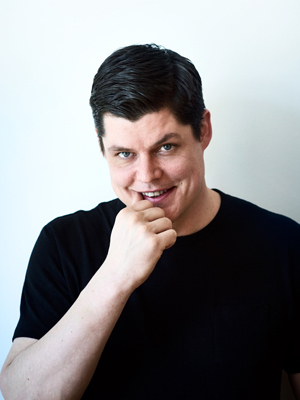 Rob is now one of the top Corporate Clean Comedians on our Roster as well, having done the prestigious Investor's Group Comedy Tour of Ontario in 2013 and slated for the Maritime and Mid-West Canada versions for 2014. Only the funniest clean comedians are chosen for these tours, so very high praise indeed! Rob is a "military brat"; he was born on a base in Halifax and moved with his military father to Edmonton. He has played various military bases throughout Canada and has been invovled with several Military Comedy Benefits. "A huge thank you to Rob for his amazing and entertaining performance at our party last night. Everyone was thrilled with his performance. He is a very charming and witty man. Rob has a natural ability to find humour in life's moments. We are very grateful that he is alive and well to be able to bring such wonderful laughter to many. Thanks for all your help in securing Rob for my event."